Underground mining is still considered one of the most dangerous occupations in the United States. The hazardous conditions involve many significant risks to the miner’s health that are known to be linked to day-to-day operations. Underground mining operations present numerous problems including working in a cramped, unsafe environment. For the miner, the threat of injuries or death remains almost constant as workers can be injured or killed by a roof collapse, faulty equipment, exposure to fumes, or falling objects. Over the last decade, an average of 60 miners has lost their lives each year while working in coal mines. The risk of dying while underground is so high that the miner is equipped with an emergency breathing device in the hope that it provides sufficient oxygen while escaping from a fire, ceiling collapse or another life-threatening calamity. Miners face the threat of being hurt or killed by an explosion, cave-in, or lack of oxygen when exposed to methane gas and carbon monoxide. While there have been significant improvements in maintaining safety in an underground mining environment, the equipment provided to miners are not foolproof. If you or a family member was injured while working at a coal mine, you are likely entitled to workers compensation benefits. Contact the workers compensation attorneys at Rosenfeld Injury Lawyers LLC for more information and a free review of your legal rights and options. Cave-ins – Over the centuries, many miners have lost their lives to cave-ins that are caused by gradually sinking land, cracks in the walls, ceiling, and floors that we can collapse the entire shaft and unsecured ceilings in the mine. Flooding – Heavy rains, flash flooding, and groundwater penetration are just a few of the ways that a mine shaft can flood unexpectedly. If the ingress of unwanted water is not contained properly and quickly, it can compromise the walls, ceiling, and floor of the mine shaft that can destroy equipment and kill miners. 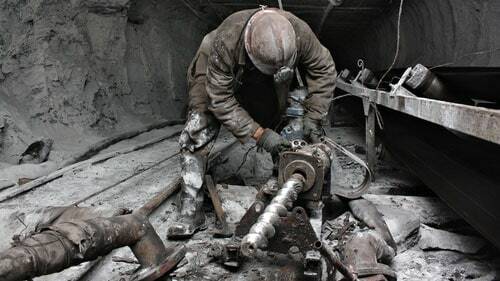 Chemical Leaking – Miners typically work in an environment surrounded by numerous chemicals used in the shaft. By not properly adhering to necessary safety precautions and procedures, a chemical explosion or accident can be a likely catastrophic outcome. The work environment must include appropriate ventilation to minimize the potential of a chemical leak by eliminating hazardous fumes and dust. This prevention measure will allow the miner to avoid long-term physical injuries if they come into contact or are exposed to the toxic fumes. Explosions – Methane gas is often a byproduct of mining. Exposure can occur when the gas builds up without proper ventilation. Because of that, employers must ensure there is a dedicated team monitoring coal mining equipment to look for any fault or malfunction that could produce a spark and ignite fumes or dust. Electrocution – The necessary heavy electrical equipment used in the mining industry can create a serious risk of severe injury or death. The potential dangers are generated by the equipment operating in a damp work environment. Any worn cable or damaged plug can electrocute the miner or produce a spark that results in a catastrophic explosion. Powered Haulage Crashes – In the four years between 2011 and 2015, collisions involving powered haulage machinery killed 21 coal miners while transporting workers, supplies, material, and work-related waste. Slip and Fall Hazards – Working in tightly confined areas with dangerous materials and moving equipment creates a dangerous work environment highly susceptible to slip and fall accidents. Even so, most these accidents could have been prevented had the foreman, owners and supervisors managed the work environment and accounted for extreme weather conditions, unguarded areas, and a lack of personal protective equipment used by the workers. Dust Exposure – Airborne dust is a significant risk to underground miners that is often left behind by drilling and blasting large chunks into very fine dust particles. When the miner inhales a breath, the dust can easily accumulate in the lining of the lungs. Over time, repeated exposure can lead to pneumoconiosis and the potential of scarring the tissue of the lungs. Also, miners can develop silicosis, an irreversible, life-threatening, disabling condition through inhalation of crystalline silica. Exposure to the dust can also lead to black lung disease. Radon Exposure – Miners’ health conditions have been linked to dangerous, radioactive, odorless radon gas that over time can develop into life-threatening lung cancer. Mercury Exposure – This heavy metal is often a byproduct of mining along with other substances because of its presence in organic mineral compounds. It is very easy for the miner to swallow or inhale mercury or absorb the metal through the skin. Unfortunately, minimal exposure to the heavy metal can lead to life-threatening poisoning or produce various symptoms that include tremors, weakness, muscle ulcers, nausea, bleeding gums, abdominal pain, headaches, cardiac weakness, loose teeth, and diarrhea. Exposure to Welding Fumes – Mining requires welding metals together by vaporizing the metal until it reaches molten heat. Excessive, long-term exposure to the materials in fusing metals can lead to pneumoconiosis, systemic poisoning, and irritation of the respiratory tract. Excessive Noise – Nearly every process of mining produces excessive noise when the engines and machinery drilling processes excavate coal materials. Listening to continuous unfiltered noise can produce significant hearing problems that could be permanent or last temporarily. Some miners exposed to excessive noise over the years have compromised speech or develop the ruptured eardrum. Heavy Loads – Many miners suffer serious back injuries, joint problems, and muscle weakness due to an excessive need to lift heavy loads. OSHA, mining regulators and employers have developed modern safety precautions. Their efforts have significantly decreased the development of serious health conditions including black lung disease. However, their efforts require every employee to receive precautionary equipment including the use of ventilators, ear protectors, and working in a ventilated area. The effort of ensuring a safe environment for workers has significantly reduced the number of cases involving exposure to harmful substances, metals, sound, and fumes. The number of coal mining deaths surged in 2017 over the previous year as recently employed workers who were new to the coal industry begin working in unfamiliar ground. These individuals tended to be exceptionally vulnerable to dying in a work-related accident. A report published by CBS in August 2017 revealed that ten coal miners had lost their lives by the late summer of 2017 compared to a total of eight coal miners dying throughout all of 2016. December 2015– For the third time in three years, an accident at the Macedonia Class Mine claimed the life of a coal miner. According to a representative with the Mine Safety and Health Administration, the most recent accident on December 8 took the life of a Marion, Illinois coal miner. The accident occurred when 20-year-old Tyler Rath was driving a company tractor while pulling a trailer that rolled over his cab. It took responders 2.5 hours to remove the victim’s body from the mine. Never Ignore Dangers – Hazardous and dangerous conditions lurk everywhere underground and on open-pit mining sites. If you remain vigilant and alert in knowing that an accident could occur at any moment, you can avoid calamities and prevent accidents that can be caused by carelessness. Plan and Communicate – Nearly every task when working underground is dangerous. Because of that, it is important to allocate all necessary money and time to train to ensure safety requirements are met. Never compromise your safety and the safety of all your associates to meet a deadline or maximize the benefits of your efforts. Assess every risk, consider every potential accident and educate yourself and others on how to mitigate probable issues. Obtain Professional Training – Every member of the team must learn routine safety practices through regular training. This educational process needs to be enforced on every member of the team, even workers with seniority. Remaining vigilant on maintaining safety in the workplace can minimize the potential for catastrophic accidents with injuries and fatalities. Where Required Safety Equipment – Your employer must issue every miner safety glasses, helmets, and other personal protective equipment to safeguard their employees’ health at all times. Consider all the miners who have survived around the world for decades because they were wearing their helmet that avoided a potential accident. Follow Team Supervision – As a part of effective safety instructions, supervisors, managers, foremen, and owners should review the rules of the job site that involve every team member. The supervision includes remaining diligent in enforcing the rules, always restricting the number of people entering the site as allowed, and knowing the whereabouts of every member of the team at every moment during that working shift. Follow Recently Released Safety Standards – Regulators of the mining industry routinely update safety standards to prevent serious accidents with injuries and fatalities. It is imperative always to use the latest safety equipment, avoid mistakes, and comply with industry standard regulations. Report Mine Safety Violations – If you see something wrong, say something. Reporting violations of mining safety rules and regulations immediately to a supervisor, owner or manager could save the lives of others and yourself. Every individual in the work environment is responsible for maintaining a safe mine. This responsibility extends to coal miners, mine operators, supervisors, safety representatives, and government agencies in charge of rules and regulations. Are You Ready to Get Started on Your Compensation Claim? 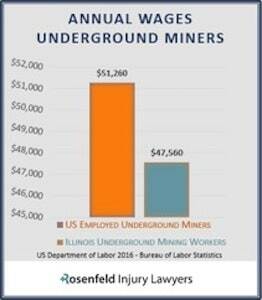 Our lawyers help injured Coal Mining Worker obtain compensation under the IL Worker’s Compensation Act and through civil lawsuits. We provide Free Case Reviews and a No-Win/No Charge guarantee. Have you received only minimal amounts of workers compensation benefits for your job-related injury? Our attorneys can show you how you are not restricted by law to seek additional compensation from third parties that might also be at fault for your damages. These additional parties could be equipment manufacturers, property owners, or many others that are negligent in their actions, or their lack of action to ensure that you remained safe while working. With legal representation, your attorney can ensure that you complete and file all the necessary documentation in the appropriate Illinois county courthouse. Our law firm working on your behalf will build a case and negotiate a settlement or take your claim to trial. Make no upfront payment for legal services because our personal injury attorneys working on your behalf are paid only after they have successfully resolved your case by winning at trial or after negotiating an acceptable out of court settlement. The legal fees are paid only after our attorneys have successfully resolved your compensation case by negotiating an out of court settlement on your behalf or by winning your case at trial. Our Guarantee ensures that you pay us only if we get the money that your family deserves!